Happy fifth birthday to the lovely Freya (Sciroco’s Freya vom Viersen CGC). Freya came to us shortly after our dear Heidi left us unexpectedly on Christmas Eve 2003. I don’t think anything ever shook my faith more than having my heart dog pass away on what is supposed to be a joyous and holy night. It was a big task for a little puppy to heal our badly broken hearts, but Freya did and still does fill our hearts. Thank you forever to Joe Hedl and Donna Hedl for the love that is Freya. Two-thirds of NaBloPoMo 2008 is now history. Just ten more posts to go! So, today I’d like you to meet Axel: Axe for short (well, he is a firefighter’s dog) and on paper, Precious Gems Axel vom Viersen. 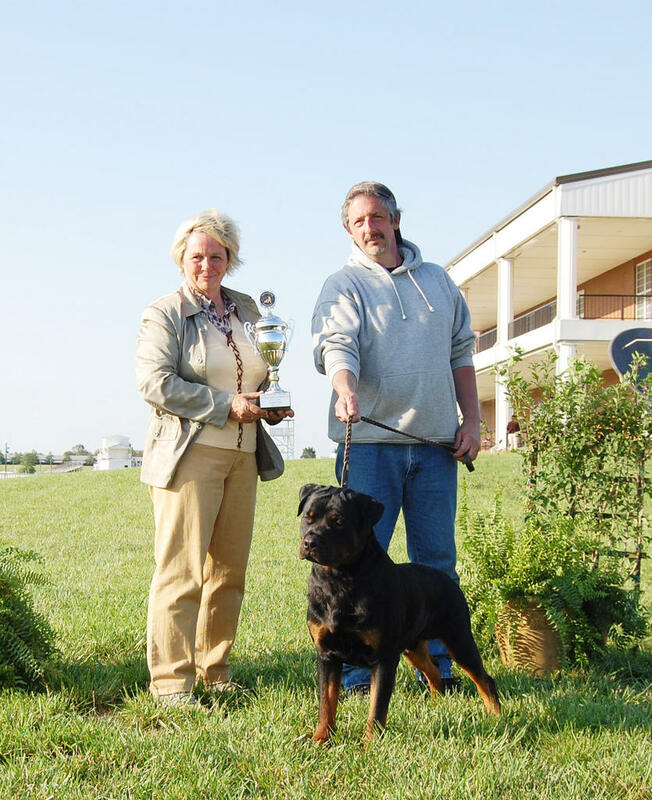 Here he is with his “grandpa” Gary and the judge at a large German-style Rottweiler show this spring. As you can see, he’s quite the handsome lad. This was his first show and he placed second in his class (12-18 month youth males). All my dogs are, above all, beloved family members. They live in the house and are with us for life. Part of me (and some will surely think it is a very shallow part) would love to have at least one dog that is great on paper as well as a treasured and loved family member: a breed quality show champion who also has working titles. I’m wondering if Axe might be that dog. So I’m wrestling with a number of questions right now. Axe will be 2 years old on the 29th of this month and thus old enough to have his health tests done. If he fails any of the tests I’m planning for him shortly after his birthday, he definitely won’t be bred. 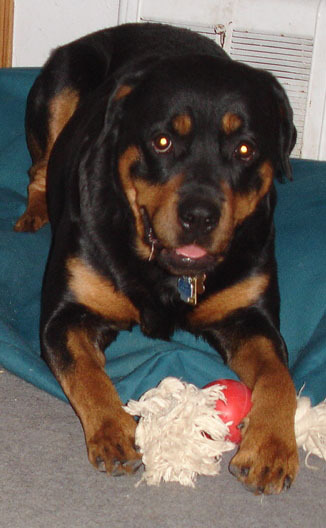 There is no shortage of Rottweilers and there is absolutely no need to breed a dog with genetic health issues. I have no reason to think he won’t pass. But of course, it’s just one of the many things to worry about. Once he passes his health tests (thinking positive here), then comes the question of his championship, which will mean sending him out with a professional handler. This is going to be a very tough decision for me. I definitely don’t want him gone a second longer than he has to be, but it’s also hard to predict how long it will take him to finish a championship. I am not one of those people who could live with having their dog gone half or more of the year, and Axe is not the kind of dog that I could easily hand over at ringside. Axe is probably the best-looking Rottweiler I’ve ever owned. He’s also been one of my biggest learning experiences. He’s extremely intelligent, somewhat dominant and outweighs me. I’m probably the worst dog trainer on earth and I’ve had some issues establishing leadership with him. His love for me is not in question. Respect though… well, he’s getting there. Or is that me getting there? The more I learn and the more he learns, the better it gets but it is still far from easy for me. Thus the next dilemma: who is going to do his working titles. I could send him to a professional trainer but I would really love to be able to do it myself. I have the nagging thought in the back of my head that he just might be too much dog for me though. At least it’s easier than worrying about how to pay for an Ivy League college for a human kid? Right? It’s terribly quiet here without the dogs. We planned to have them stay at the kennel an extra day so that the cats would have a full day and a half of dog-free time and space to forgive us for daring to go on vacation without their express approval and blessing. As it turns out, although Annie definitely appreciated the dog-free day, Oliver misses “his” dogs and is actively hunting for them and calling out to them. He has a weird sound that he makes that sounds more like a bark than a meow. That is how I know he is talking to the Rottweilers. We’ll be picking them up tomorrow afternoon and all will be back to normal. Or at least as normal as it ever gets around here. If you found me via NaBloPoMo or Facebook, you’ve seen my icon featuring lovely Freya and feisty Oliver. Oliver says, "I'm winning now!" Oliver is about a year old in this photo (he’ll be 3 years old in March 2009). 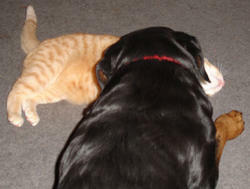 Unlike our older cat Annie who prefers to stay away from the dogs and wouldn’t dream of actually touching them, Oliver embraces his inner Rottweiler. He is often spotted chasing or being chased by the resident Rottweilers. Slow speed, of course; they (mostly) abide by the proper rules of indoor games. They also often wrestle as in the photo. Oliver really does think he’s winning once he gets a good grip on a snout or leg. Freya was in a false pregnancy following a heat when Oliver came to live with us. During a false pregnancy, the pseudo-expectant mom will often adopt an object as her “newborn puppy.” Although Freya’s usual puppy was a stuffed animal, this time she adopted Oliver as her funny-looking orange puppy. 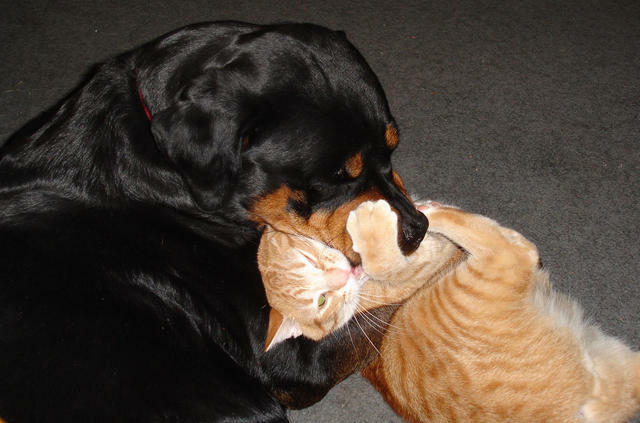 He was raised as a Rottweiler by a Rottweiler, and this is just what he does. Take a moment if you would to click on the small photo and enjoy a short sequence of a Freya and Oliver wrestling match! The main event - Freya and Oliver! Less than three days to go until we leave on our annual fall trip to Honolulu, that is! Due to some unfortunate schedule conflicts, we had to drop the dogs off at the boarding kennel today instead of Friday. It is very quiet without the pitter-patter, or should that be rumble-thunder-whomp, of giant Rottweiler paws through the house. For those that didn’t “know” me before NaBloPoMo, I was born in Honolulu and lived there until I went away to college (Northwestern University, Evanston, IL). I didn’t graduate, but I did stay in Chicago since it was a great place to make a decent living at the time. The reason the trip to Honolulu is an annual one is because the rest of my family is way smarter than I am, and stayed there or returned there after their time away. And in regards to an earlier post where I stated I was unwilling to fully support either presidential candidiate, I’m sure some of you are now wondering how it is that I couldn’t support someone whose life took the same geographic path that mine did. For the record: I’m 3 years older than Barack Obama. I also went to Punahou, but only until the third grade (I graduated from a public high school, McKinley). If you saw the photos from Obama’s trip to Honolulu to visit his grandmother, her apartment is a block from the Buddhist temple my grandmother belonged to, and the dormitory where my mother worked for a few years. One of my own jobs during high school was in that neighborhood as well. My life in Chicago has been almost completely apolitical though, except for belonging to ABATE (motorcyclists rights group) and making my phone calls or writing my letters against any type of breed-specific legislation. I might come back to that later, or not. Not tonight though. I also think I’ll save any Honolulu-related thoughts for when I’m actually there, and when I can post photos to go along with my thoughts. 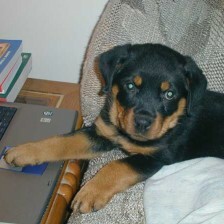 Back to the Rottweilers for a moment though. I miss them already. Soooooo quiet here!